An effective website grabs the visitor's attention and keeps it just long enough to give them the information they came after. 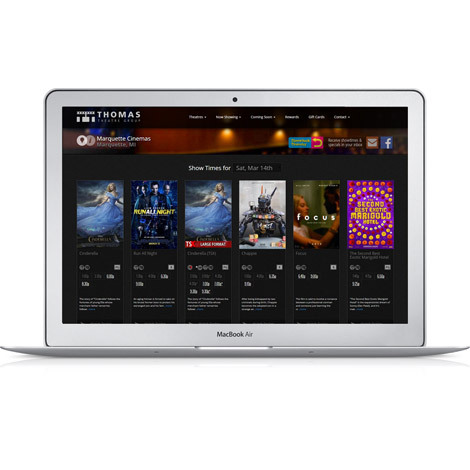 Any potential customer that visits your cinema website is looking for key information in a logical, easy-to-use format. They want to know what movies are playing, what time they start, how to get to your theatre and how much it will cost them. Cinemahosting.com understands YOUR customers, what they are looking for and how to deliver the information in a concise, effective manner. They don't have to scroll to find the important information. They shouldn't be distracted by unnecessarily flashy graphics. With CinemaHosting.com, your customers get the information they want immediately, so they can make the "purchase decision". Utilize a cinema website provider that understands your business and what your customers are looking for. Cinemahosting.com has a proven history of providing effective theatre websites that drive increased business through your cinema doors.